White House press secretary Sean Spicer on Monday slammed reports about President Donald Trump reorganizing the National Security Council. Spicer defended Trump's decision to sign a presidential memorandum that removed the nation's top military and intelligence advisers as regular attendees of the NSC's Principals Committee, the interagency forum that deals with policy issues affecting national security. The executive measure established Trump's chief strategist, Steve Bannon, as a regular attendee, whereas the chairman of the Joint Chiefs of Staff and the Director of National Intelligence would be encouraged to participate only "where issues pertaining to their responsibilities and expertise are to be discussed." Spicer insisted that Gen. Joe Dunford, the chairman of the Joint Chiefs of Staff, and the Director of National Intelligence would be able to attend Principals Committee meetings. "There's been a lot of misreporting this week about what this memo does and does not do, so let me walk you through this real quick," Spicer said, adding, "The Principals Committee is merely the NSC minus the president," Spicer said. "The idea that the chairman of the Joint Chiefs of Staff and the DNI are being downgraded or removed is utter nonsense." Spicer continued: "They are at every NSC meeting and are welcome to attend the principals meetings as well. To be clear, the memo lays out that if there's a Principals meeting that is outside their scope, for example a domestic issue that doesn't pertain to the military, they're not required but certainly welcome to be in attendance. We recognize that certain homeland security issues may not be military issues and it would not be in the best interest of the Joint Chief's valuable time to be at these meetings." The White House press secretary compared Trump's recent memo to those from 2001 and 2009. "The makeup of the principals committee from 2017 is exactly as it was in ... 2001," Spicer said. He continued: "The president holds Chairman Dunford in the highest regard. The suggestion that he would downgrade the important role that the chairman plays in matters of national security reveals a fundamental misunderstanding of the tremendous respect that the president holds for both the chairman himself and the Joint Chiefs as a whole." Spicer also took on former President Barack Obama's national security adviser Susan Rice, who tweeted on Sunday: "Chairman of Joint Chiefs and DNI treated as after thoughts in Cabinet level principals meetings. And where is CIA?? Cut out of everything?" "I know someone tweeted out 'where was the CIA in this' — the CIA hasn't been part of the NSC since the DNI was sworn in for the first time in 2005," Spicer said. He then held up a print-out of Rice's tweet. 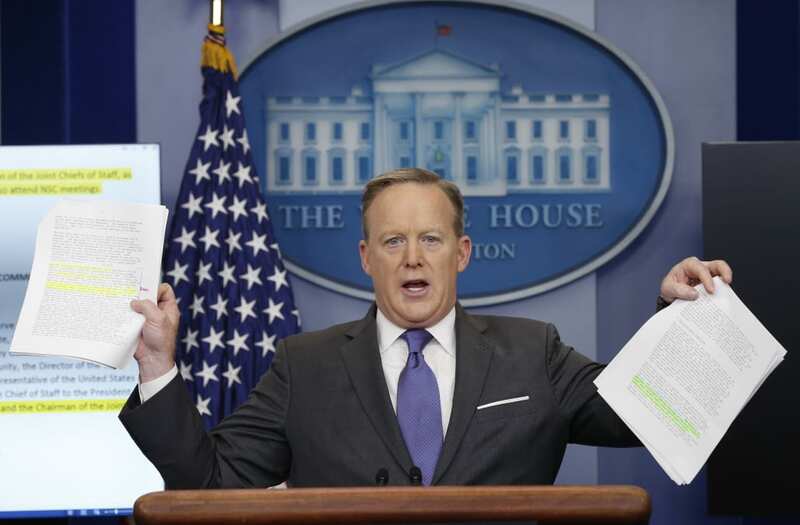 "I'd like to remind the former national security adviser that when the memo was drafted in 2009, I don't see the Obama administration including the CIA in theirs," Spicer said. He also announced that Trump would add the CIA director into the NSC.